We now return to KITT-FM, where it's all kittens, all the time. And now, broadcasting live from our studios in Purrbank, Cat-i-fornia -- heeeeere's your hostess, Mother Catresa! Isn't she beautiful? 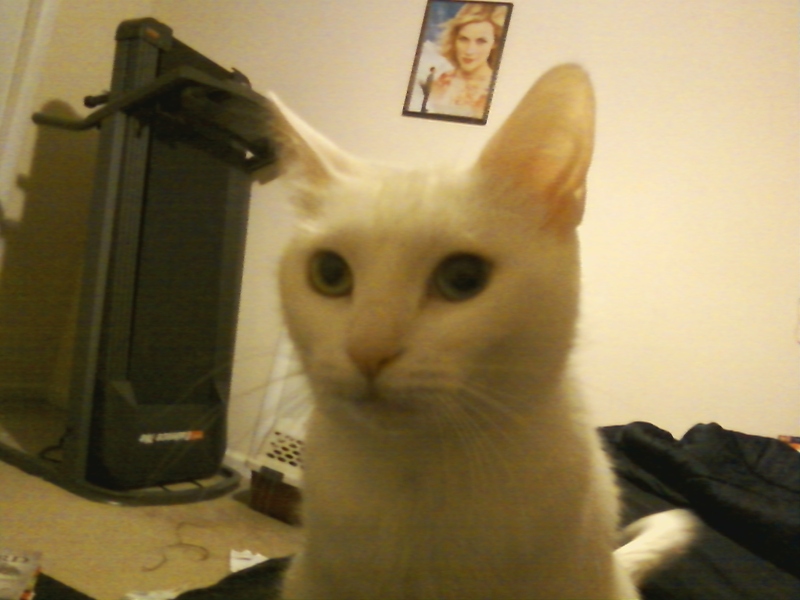 Her name is Bella, and she is the second white cat in a row that I have fostered. Snowball, the longhaired Angora lion, is happily settling into his new home, while this beauty stays in my guest room, and waits for me to take her to a Petsmart cage. I sleep in Bella's room a few times a week, and love the warm fuzzies she gives me. As is often the case, I am appalled by how Bella ended up with us. A man called a woman who works at a vet's office, saying that his girlfriend had dumped her cat outside at a farm. Said girlfriend's rationale? The kitty more likely would survive there than at a kill shelter. The vet woman, who later called my organization, told the guy to go find that cat -- unspayed, not surprisingly -- and bring her in. I thank that thoughtful man for helping, and hope he breaks up with that heartless biyatch of a girlfriend. Imagine what kind of mother she'd make! Bella's short, pure-white fur makes a pretty backdrop for her stark, unusual eyes: one blue, one green. She is sweet, but has a sassy side too, and sometimes gets overstimulated while petting. She might suddenly hiss during a loving petting session, but it's harmless, and she'll purr and come back for more, often within seconds. I honestly don't mind this peculiarity, though I wish I could break her from the habit (I'm trying, that's for sure, and she's made some progress). Bella is so lovely otherwise that I overlook this flaw. She would do best in a home without children, who could easily annoy her with too much, or too rough, petting, and get bitten. Truth is, I'd keep Bella if I could. I love white cats -- I had two as a child -- and I am falling in love with this fair-headed beauty. Therefore, I must take her to Petsmart very soon, before my heart starts negotiating my cat population limit with my head. Now, on the spring equinox, I have some exciting news to announce: I am getting my first litter of kittens tomorrow! The four babies come from a nice neighborhood stray cat that a kind woman took in before calling us (Foster Cat, Inc.) for help. Mom and babies are staying in the basement, and I will pick them up tomorrow night. So long as the male-female breakdown works -- I need at least two girls, and at least one boy -- I am naming this litter after the family of two of my dearest friends from middle school: twin sisters Joy and Erin, and Douglas (their last name, and good name for a male kitten). And the mommy cat will be Bonnie, who is Joy's and Erin's human mom. Who are these namesakes, you ask? Now, that's another story. It's a loooong story. It's a sweet story. And it's a story still highly relevant to my life, two lifetimes later. Remind me to tell it to you sometime.